It lies close to the direction of the open cluster Messier 52. The "bubble" is created by the stellar wind from a massive hot, 8.7 magnitude young central star, the 15 ± 5 M☉SAO 20575 (BD+60 2522). The nebula is near a giant molecular cloud which contains the expansion of the bubble nebula while itself being excited by the hot central star, causing it to glow. 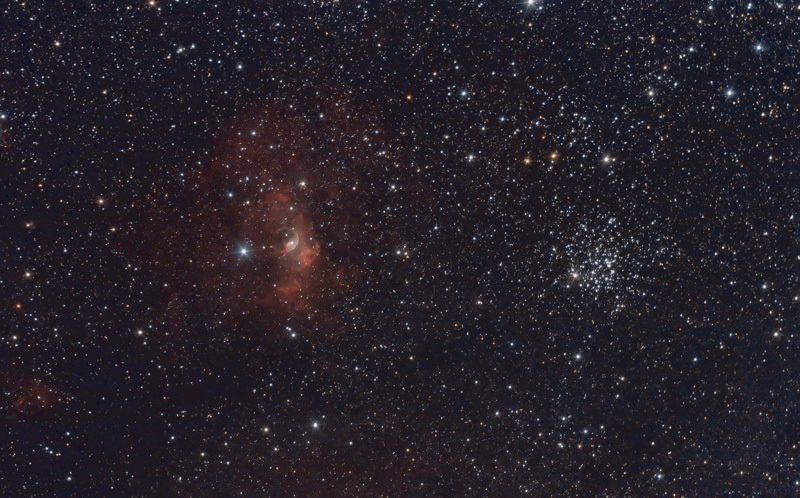 With an 8 or 10 inch telescope, the nebula is visible as an extremely faint and large shell around the star. The nearby 7th magnitude star on the west hinders observation, but one can view the nebula using averted vision. Using a 16 to 18 inch scope, one can see that the faint nebula is irregular, being elongated in the north south direction.